WESTBROOK — Just months after getting the go-ahead to build an amphitheater at the Rock Row development, Waterstone Properties Group and Waterfront Concerts have announced the first concert at the soon-to-be-built venue. Shinedown, a hard rock band from Jacksonville, Florida, will take to the stage at the newly named Maine Savings Pavilion at Rock Row Saturday, June 29, in a concert that will also feature Badflower, Dinosaur Pileup and Broken Hands. Shinedown performed in November 2015 at the Cross Insurance Arena with Breaking Benjamin, in November 2016 with Five Finger Death Punch at the same venue and in June 2017 at the Rise Above Festival in Bangor. The Shinedown concert is the first of up to 16 shows that could take place at the Maine Savings Pavilion between late May and late September. Waterfront Concerts is “starting to make traction” in scheduling other shows there, but no acts have been set, Wheelden said. “We’re very aware of what artists work well in southern Maine and we anticipate filling the calendar with what are sure to be the social events of the season,” he said. The Westbrook Planning Board approved the amphitheater in December with certain conditions – no more than two shows can be held in a seven-day period and events must end by 10 p.m. Sunday through Thursday and by 11 p.m. Friday and Saturday. The board also set sound limits. Waterstone, which is planning to develop the land around the amphitheater into a mixed use development of shops, restaurants, residences, offices, entertainment and recreational opportunities, anticipates the new venue will create upwards of 100 new jobs. The amphitheater will be temporary so Waterstone and Waterfront Concerts can determine if the amphitheater concept works. If it does, the venue would be moved to a permanent location on the property, and the temporary site would then be used for a permanent parking structure, as well as the second phase of Rock Row’s master plan. Josh Levy, co-founder and principal at Waterstone Properties Group, is expected to appear before the Panning Board in April to unveil plans for the second phase, which includes shopping, dining, commercial and residential units. A 80,000-square-foot Market Basket, expected to open this fall, will anchor a large shopping complex at the front of the property that will include a Starbucks, The Paper Store and other still unnamed tenants. The establishment of Maine Savings Pavilion will mean the end of concerts at the Maine State Pier, where Waterfront Concerts has held summer shows since 2015. 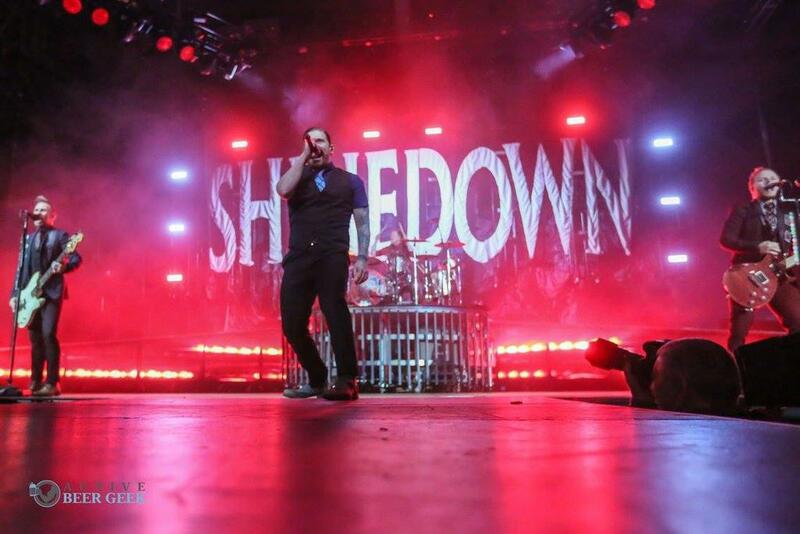 Shinedown, a hard rock band from Florida, seen above in a November 2015 concert at Cross Insurance Arena in Portland, will be the first act to perform at the Maine Savings Pavilion at Rock Row. The Maine Savings Pavilion is the name of the temporary outdoor amphitheater to be built on the back corner of the property Waterstone Properties Group is developing into Rock Row.